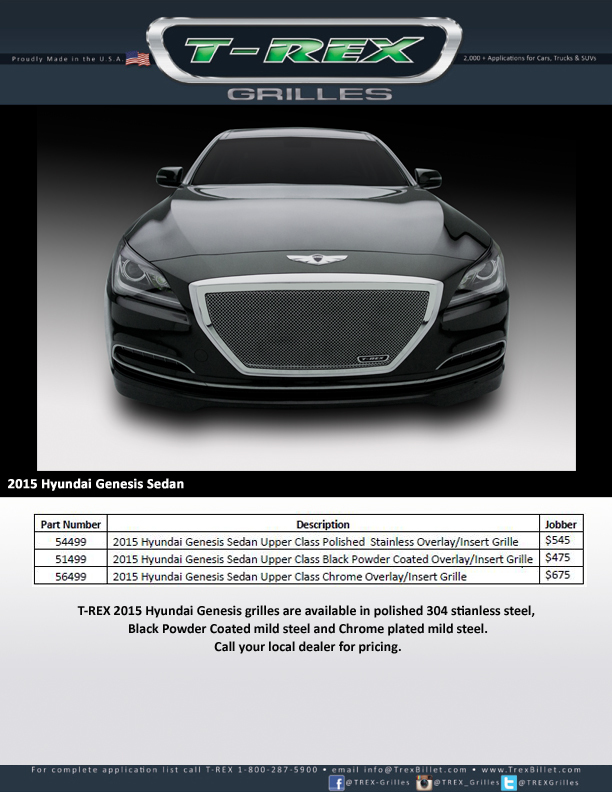 T-REX Grilles is proud to announce the release of three (3) new grilles for the 2015 Hyundai Genesis sedan. These beautiful new grilles feature formed mesh and a CNC machined beveled frame to seamlessly integrate with the newly designed Genesis factory grille sheel. As with all T-REX Grilles products, these new grilles were designed in house to compliment the 2015 Hyundai Genesis sedan. Each grille is manufactured to exact tolerances in the U.S. for a perfect fit and finish every time. Available in a durable black powder coat, highly polished 304 stainless steel and triple chrome plated finish and are backed by an industry leading Limited Lifetime Structural Warranty and 3 Year Limited Finish Warranty.